One of the commons SysAdmin job is perform server management. VMware vSphere management server can actually be done remotely using the vSphere Client access (based on Windows) , Web Client or can also use 3rd party mobile applications . Along with the development of technology, remote server management via mobile devices such as gadgets or tablet getting absolutely necessary. For this purpose, VMware released a mobile application to perform vSphere management, especially for critical VM monitoring. 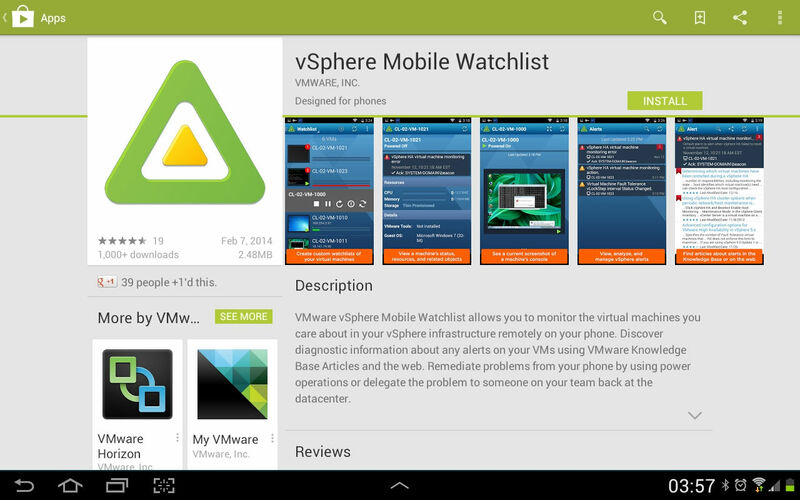 This application name is : VMware vSphere Mobile Watchlist. This application is available for both Android and Ipad / Iphone. Based on the official announcement of VMware , the Windows mobile version is not currently available yet, CMIIW. I’m installing the Android version of VMware vSphere Watchlist on Galaxy Tab and Galaxy Note with Android OS version 4.0.4. To perform the installation simply open the following link : https://play.google.com/store/apps/details?id=com.vmware.beacon&hl=en or can also use the short link : http://bit.ly/1ezGY7c. Before continuing, do click on the Gear icon to make some changes . For example, if using untrusted SSL certificate on vCenter, enable the Trust All Certificates option . 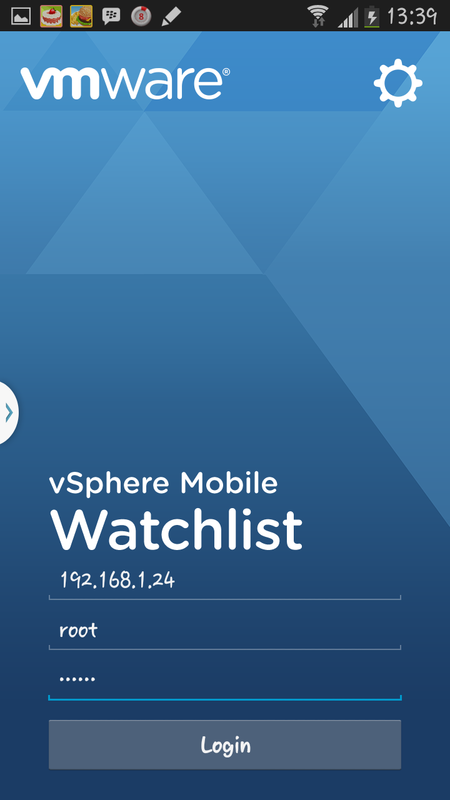 Please note that vSphere Mobile Watchlist can only be used to accessing vCenter server. It can’t access directly into vSphere host with the following error message “The session is not authenticated“. After selecting the VM into the list control, we can return to the main page and see detailed information for each VM. VMware vSphere Watchlist allows us to perform remote management VM, we can directly check or even controlling VM power state. Select a subset of VMs from your VMware vSphere VM inventory to tell the app what VMs to track. Use multiple lists to organize these important VMs. Review the status of these VMs from your device including: their state, health, console and related objects. Got an alert on your VM? Let VMware vSphere Mobile Watchlist suggest what KB Articles might help you or search the web to gather more information. Use power operations to remediate many situations remotely from your device. For those situations where you are not able to fix an issue from the device, VMware vSphere Mobile Watchlist will enable you to share the VM and alert information along with any suggested KB articles and other web pages relevant to the current problem. Your colleagues back in the datacenter can use this context to resolve the issue. Traveller, Open Source Enthusiast & Book Lover. Works as Independent Worker & Self-Employer.